That's right folks, my friends and I made it (mostly alive) through week one of Insanity! Yay! The first few days my legs were so sore I could barely walk. Going down stairs was agony. Even the little fit test on the first day made me hurt. I am proud to say that only one week later I have already noticed improvements! I think we all have. For one, we can move after the workouts and the next day. Second, we can get through more of the warm up than we could at first (I know it's just the warm up but if you haven't seen in, its a whole workout in itself...). We have a few motivational things to get us through. 1) Probably the most important thing: we have each other to keep us going and we are establishing a routine. Moral support is wonderful! 2) Afterwards we share a nice, healthy snack: bananas, apples with peanut butter, pita and hummus, chocolate milk, protein shakes, cottage cheese, etc. 3) Most days we visit the hot tub in the apartment complex. Very nice. 4) At the week's end once we finish at the hot tub we make and share a healthy dinner. This week Kat made a veggie casserole. 5) At the end of the 60 days we promised ourselves a treat. Maybe a spa day or something similar. 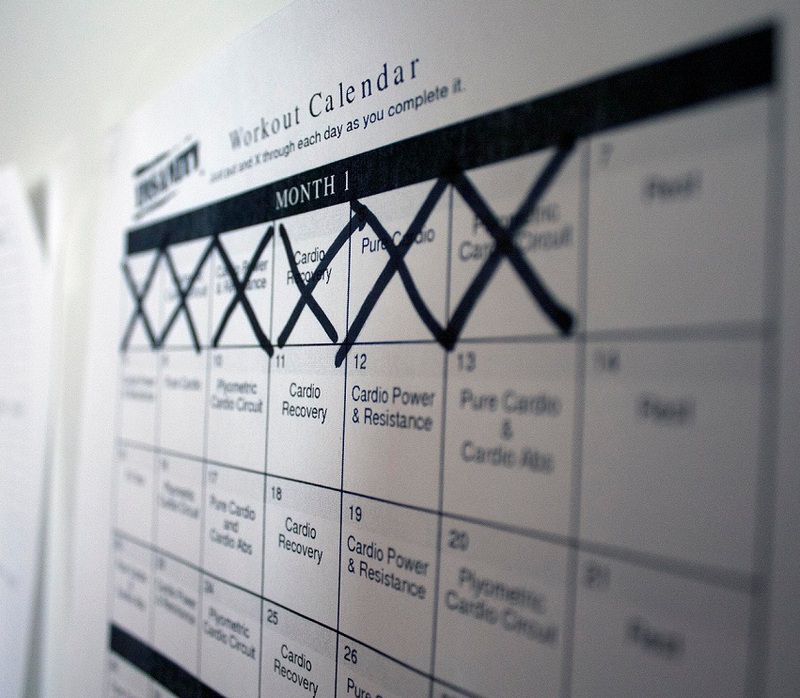 6) And last but not least, getting to cross off the workouts on the calendar with a very decisive black X.
YAY! We feel great about what we are doing and we can't wait to be in amazing shape! 1) See the list above for additional motivation and tips. 2) Do extra stretches of your own (we think his are bunk, honestly, they don't do nearly enough and no arm or ab stretches. His stretches also require you to support your body weight while you do them and usually our legs are too shaky to get a good stretch. So we do his and then we do more on the ground...). 3) I got this from a co-worker who is super-fit: after you work out and stretch, lay on your back and put your legs up against a wall. This helps get rid of lactic acid (so I am told). It seemed to help some and I guess it can't hurt!